Russian Avant-Garde was a large wave of modern art that directly clashed with the state sponsored form of Socialist Realism. Beginning in the late 1800’s in Imperial Russia, the broader Avant-Garde topic included smaller movements such as Suprematism, Constructivism, and Russian Futurism The movement reached its peak popularity during the Russian revolutions of 1917 and 1932. Many of the most popular artists emerged from the Ukraine area. Futurism was an artistic movement that followed the principals of the “Manifesto of Futurism” which emphasized modernism and a rejection of the past. Prominent themes in these artworks included industry, machinery, violence, and youth. The piece Revolution, (1917) is by David Burliuk who is also the co-author of A Slap in the Face of Public Taste which is said to be the start of the Russian Futurism movement. Burluik grew up in the Ukraine and trained at the Royal Academy in Munich. It is said the two things most important in Burluik’s life were his wife and his country. His focus was in art, architecture, and poetry, he was also involved in many art groups. This piece is interesting because it features different shapes and textures. I believe the metal objects speak to the modernization and industry themes of the Russian Futurist movement. The title Revolution most likely has something to do with the figures at the bottom trying to kill each other. 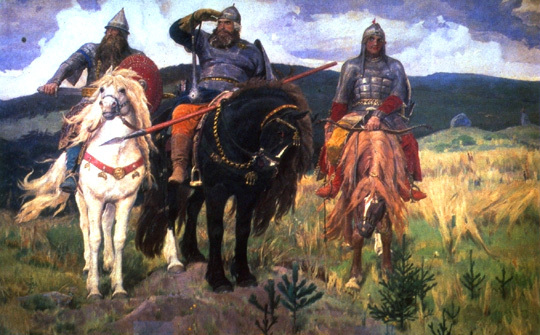 A key figure in the Russian ‘Revivalist’ movement, Viktor Vasnetsov, considered the co-founder of Russian folklore and nationalist painting, created possibly his most famous work “Bogatyrs” in 1898 which depicts mythical Russian knights Dobrynya Nikitich, Ilya Muromets and Alyosha Popovich. These three men were a famous trio of knights who served Prince Vladimir I of Kiev. Each man was known for a specific trait: wits, courage, and spiritual power. Vasnetsov began his life in a remote village in Eastern Russia. He was influenced by his father Mikhail who was a member of the priesthood, had an academic background in the sciences, and was an icon painter. At a young age Viktor began to paint landscapes and village life. In 1867 he was admitted to the Imperial Academy of the Arts but rebelled with other members of the Peredvizhniki and later joined the movement in Paris where he became fascinated with illustrating Russian fairy tales. He later returned to Moscow where many of his most famous works were created. In 1884 Vasnetsov was commissioned to paint frescoes in St. Vladimir’s Church in Kiev. He faced many critics for this project and some of his other works. During his later career Viktor spent time working on mosaics and in architecture. I enjoy this painting first, because of the backstory these three Knights have. I find it very similar to many stories told today where there is a group of soldiers who have strengths that make them an effective team (ex. Kelly’s Heroes) . Second, I see Vasnetsov’s portrayal of the knights as a snapshot of an adventure undertaken by the knights, the painting itself is a moment in a long story. Third, the painting would be something interesting to experience, I cant think of anything more fun than gearing up in a full suit of armor with your two best friends to go out into the wilderness and slay your enemies.